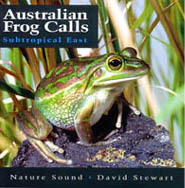 The frog calls on this CD include all species found in subtropical eastern Australia, except the two whose calls have never been recorded - Southern Day Frog (Taudactylus diurnis) and Peppered Tree Frog (Litoria piperata). The region is bounded by Rockhampton (Tropic of Capricorn) to the north and Nowra (Shoalhaven River) to the south and includes the Great Dividing Range. Calls of 70 species are included, and whenever a species has two races with distinctly different calls, both are provided. Conservation status is noted for each species within this region, but note that this information is based on current knowledge (plus personal observation and consultation with frog specialists), and should only be used as a guide. An assessment of abundance i.e. Common, Uncommon, Rare, Vulnerable and Endangered is provided, although dramatic changes in populations of some frog species can occur very quickly. The status given specifically relates to frogs within subtropical eastern Australia and is not necessarily applicable to a species over its entire range. A number of species are listed under the Queensland Nature Conservation (Wildlife) Regulation (1997) as Endangered (Schedule 2), Vulnerable (Schedule 3) and Rare (Schedule 4); for New South Wales under the Threatened Species Conservation Act (1998) as Endangered (Schedule 1), and Vulnerable (Schedule 2) - these are indicated with a Schedule number where applicable. All others not listed in this schedule are 'common' species under the Act. The large Litoria group follows alphabetical order in the cover. However, some species in this group are closely related and it can be useful to group these species together so that calls can be more readily compared when separating species in the field.